This semester, I am using course release time to focus on a research project that I am tentatively titling, “The Language of Computers in Science Fiction, 1975-1995.” Most of my readings come from SF magazines, but I’m finding some material in anthologies, too. More to follow…stay tuned. I had a fun and productive time during this year’s Spring Recess in our new home of Brooklyn. 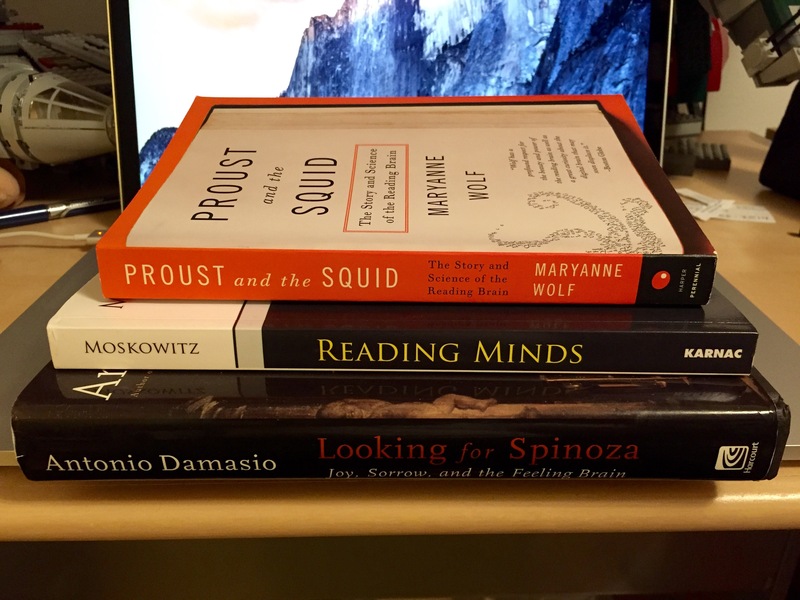 I read three brain-related books: Maryanne Wolf’s Proust and the Squid, Michael Moskowitz’s Reading Minds, and Antonio Damasio’s Looking for Spinoza. I took the subway to Manhattan twice with Y and Little My to visit Kinokuniya Bookstore, Sun Rise Market, Uncle Sam’s Army Surplus, the New York Public Library, and Washington Square. I picked up an M65 field jacket and put together an EDC kit. I walked to Microcenter twice–each time scoring a free 16GB flash drive thanks to a new coupon promotion. To cap the week off, I completed a draft of my PARSE documentation for advancement at City Tech and posted assignments for tomorrow’s classes on OpenLab. Now, I feel ready to see this semester through to the end. A question for my students: how did was your week away from the college? Are you ready to see things through? This is Georgia Tech’s spring break week, so I’ve decided to pause my Recovered Writing project. It will restart Monday, March 24. In the meantime, you can catch up on it so far by going here. While (I hope) my students are resting and recuperating from the spring semester thus far, I will be working. I have a big book review to finish, an essay to continue revising, and grading to complete in ENGL1101 and LCC3403. Apple rolled out the new Mac Security Update 2011-003 to address threats posed by the latest family of malware under the MacDefender moniker. Keep your system up-to-date with Apple’s built-in Software Update program (Apple menu > Software Update), and if your system is infected by MacDefender, the security update will helpfully nuke it. After you install the update, consider protecting yourself with some advice that I offered in a previous post.